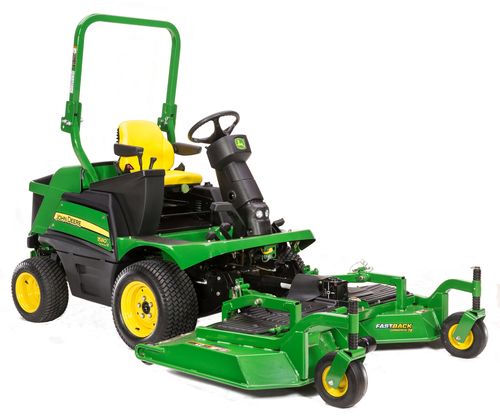 John Deere will be unveiling the new 1500 Series TerrainCut commercial front mower range for the first time in the UK at IOG SALTEX 2014 in September, on the Farol dealership stand (F35). Equipped with powerful, high-torque, three-cylinder diesel engines, four-wheel drive, high-capacity rotary mower decks and a new optional grass and leaf collection system, the 1500 Series can mow and collect thick grass at high speeds and still produce a quality cut. A robust hydrostatic transmission allows the mowers to perform well over rough terrain and in tough grass conditions. The two-speed transmission on the 1580 and 1585 models also allows faster working speeds and a transport speed of up to 25kph (15.5mph). All 1500 Series models come with durable 7-iron mowing decks, so they can tackle thick, wet grass with ease and disperse the clippings evenly; a mulching kit is also available. A new 25 to 152mm (1 to 6in) height of cut adjustment improves cut quality and performance by stabilising the deck’s rake angle. Key user-friendly features include cruise control, a comfortable seat, Twin Touch pedals for the transmission and an electro-hydraulic deck drive clutch, while an air ride seat is optionally available. In addition, the 1575 and 1585 are equipped with a new, comfortable cab that provides 360-degree visibility. The cab features an air conditioning and heating system for comfortable year round use, and the air ride seat is standard on these models. The 1585 model also comes with an increased axle load capacity to hold the high-specification cab as well as the optional quick-attach GLC1500 grass and leaf collection system, which has a hopper capacity of 600 or 900 litres. The mower’s front pto is used to supply power not only to the mower deck but also to the collector’s blower drive, which makes installation and removal easier and also reduces heat in the hydraulic drive system. When the hopper is removed, the drive train – which includes the motor, oil tank and blower – remains with the hopper, making the whole machine more flexible in use. The collector’s fast dump speed and 203cm (80in) high tip/83cm (33in) long reach features also increase overall productivity.